Capable of 24 distinct movements, the hand can come up with an almost human array of positions to hold a Rubik’s cube, business card or light bulb. The finger lengths vary like a person’s too, giving the hand a more organic feel than many of itscompetitors. But it’s not just shape that robotic hands have to worry about; they also have a grip-of-death problem that means you can’t trust them with a wine glass or a raw egg. Dexterous Hand tackles that problem with the combination of a position sensor in each joint and a force sensor for each motion activator. It also includes tactile sensing on the fingertips. With all that, Dexterous Hand could just give the human hand a run for its money. Then again, pricing hasn’t been made public. Of course, like our hands, Shadow’s hand is only as good as the arm behind it. 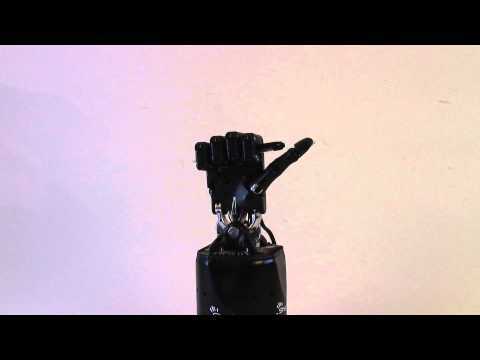 The hand itself sits Thing-like in a stand, but Shadow has designed it to integrate into other robots.Kuka, Denso, Willow Garage, Mitsubishi and Universal Robots have all mounted a Dexterous Hand, which runs on the open-source Robot Operating System, on one of their droids. Since hands are so specialized, even makers of robotic arms seem happy to outsource them. Different robots will likely employ different hands, but with various makers making robotic hands with different specialties — this one emphasizes precision, another emphasizes durability — that promises to work out just fine.